At the end of March and beginning of April, we were excited to host some more guests in our tiny home: Curtis’ family! I had a great week showing them around the island to some of our favorite spots, and checking out some new places with them as well! Unfortunately for Curtis, it came at a time when things were more eventful at work so he wasn’t able to take much time off, but we were thankful that he was at least on island for their entire visit. Fortunately for me, it came at a time when Curtis was working long hours and having company helped make time go faster! Friday, March 29 | They arrived in the afternoon. After lunch (featuring our homegrown Okinawan Sweet Potatoes) and showing off our home, we went for a walk on Kailua and Lanikai Beaches — it was Claire and Julie’s first time at the Pacific! 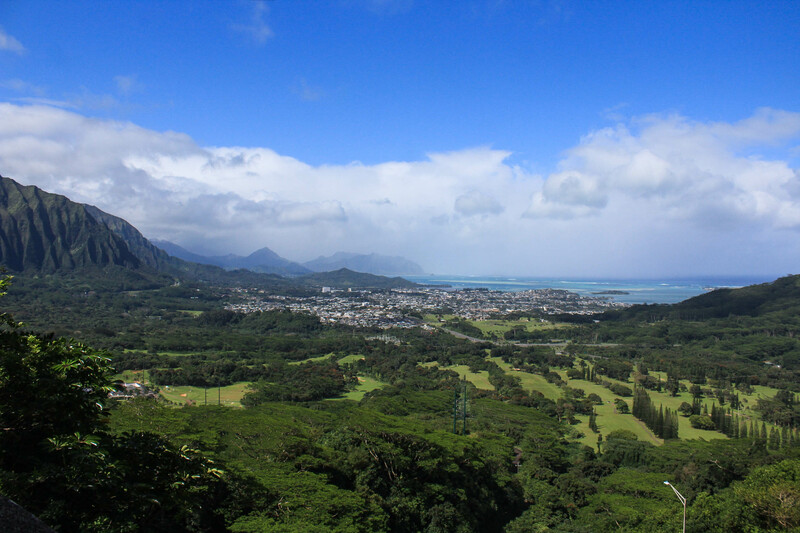 Saturday, March 30 | After stopping for letterboxes at Bellows Air Force Beach and Waimanalo Beach, we went for a walk around Koko Crater Botanical Garden. For lunch, we went to Zippy’s in Hawaii Kai, then visited the Mount Tantalus Scenic Overlook and National Memorial Cemetery of the Pacific. Sunday, March 31 | We were finally able to go pick up Curtis from his 72 hour shift, then we went to visit the Swap Meet held around the Aloha Stadium. It was Curtis and my first time there, and we learned that this is a good place to go get…well, just about anything, from souvenirs to fresh produce to clothing to gear and more! Next, we drove up to Wahiawa and walked through the botanical garden up there, then stopped for lunch at the Islander Drive Inn. That afternoon, Curtis, Ray, and Claire went snorkeling at Lanikai Beach while Julie and I prepared for dinner. Since Ray has some extended family also living on island, we hosted a mini family reunion for dinner that night! Monday, April 1 | Curtis went back to work that morning, and we went to spend the morning around Pearl Harbor. We took the AZ Memorial tour, Ray, Julie, and Claire toured the Missouri, then we met Curtis for lunch at 604. Afterwards, we returned to Ford Island to see the Utah and Oklahoma Memorials and find some letterboxes, then did a little more letterboxing in Pearl City. Feeling the need for a sweet treat on this warm day, we drove up to the Dole Plantation for some Dole Whip — my first time! It was delicious and I’m now in search of a copycat recipe. Wednesday, April 3 | This morning, we rose early for a sunrise hike up to Makapu’u Point. Afterwards, we grabbed Leonard’s for breakfast and stopped to see the Halona Blowhole. That afternoon, we drove up to the Polynesian Cultural Center in Laie and fit in as much “island hopping” as we could. Curtis was able to drive up and join us, and we all enjoyed dinner and the show, “HA! Breath of Life” together that evening. Thursday, April 4 | Since it was shaping up to be another warm day on the island, we decided to visit Ho’omaluhia Botanical Gardens in Kaneohe since they have easier walks and are more shaded than other areas on island. We lucked out with perfect, cloud-free mountain views here as well! That afternoon, we took advantage of free re-entry into the Polynesian Cultural Center to fit a little more exploring in. On our way up, we also spotted a monk seal resting on a beach! Friday, April 5 | On their last morning, Ray and Julie planned to go snorkeling at Hanauma Bay, but knowing that Claire had wanted to do more hiking, I had them drop us off for the Lanikai Pillbox hike. I enjoyed reconnecting with her as we climbed up to the bunkers with scenic views over Lanikai Beach and the entire Ko’olau Ridge free of clouds. Once finished with the hike, we walked to Kailua Beach until Ray and Julie came to pick us up. We had one last lunch together before they began their long trip back to the mainland. Would you believe it if I told you that in my first year and a half of living here, I had never once fully immersed myself in the ocean or gone snorkeling? It’s true — Curtis and I are mountain people and not beach people, and we cling tightly to that label. When we found out we were moving here, we assumed that at some point we would either try snorkeling or maybe even diving, but whenever the weekend rolls around all we want to do is go hiking. Hiking is just easier — it takes less planning, we’re more comfortable and experienced, and even the busier trails are still less busy than most beaches on a sunny day. However, Mitchell spoke so highly of snorkeling that we knew we just had to try it with him. After our first time snorkeling, our reaction was the same: “What took us so long? !” It’s actually much easier than we had led ourselves to believe; we already had some goggles and snorkels from Goodwill, all we need are the right beaches or conditions of waves. Thanks to Mitch’s instructions, we both picked up on it and were introduced to a whole other side to the island we hadn’t enjoyed before: underwater. Of course seeing and learning about the many types of colorful fish that live here is the most exciting factor, but for me, I found the coral so interesting to look at after spending over a year looking down on it from hikes such as Ka’iwa Ridge and Hanauma Bay Ridge. I’m not saying that we’re giving up our “mountain people” title, but maybe we’ll be a little more open to visiting the beach more often now. Curtis’ first experience snorkeling came the next day, after our hike to Kaena Point. We wandered down the beach towards the Southern end of the state park, and since it was a weekday we basically had it all to ourselves. There were signs in place saying to watch out for the stronger waves, but on this day we were fine. The guys started off just practicing snorkeling in the surf and quickly spotted more Humu-humu. And as they got more comfortable with the waves they started venturing out towards a reef and caught sight of plenty more fish: tang, butterfly fish, angel fish, trumpet fish, and a couple puffer fish. The coral was also really cool; Curtis especially liked the pencil coral. One of these times we’ll take the Go-Pro with us so we can show what we’re talking about. On weekends, most beaches tend to be pretty busy, so on Sunday we opted for a less popular one: the military access only side of Bellows Air Force Beach. The waves were much stronger on the Windward coast that day, but that didn’t stop the guys from going swimming, boogie boarding, and getting crushed by the waves. I enjoyed my spot safe on the beach with the mountain views, watching them get knocked around. 😉 We also discovered that the military side of this beach has a mini golf course, so we played a game together, with Curtis and I hoping to make a comeback after a game that took place several years ago. Alex still took first place today, but I happened to be the only one who got a hole in one, which is basically as good as winning. For Mitch and Alex’s last day on the island, we did a long drive around the North Shore. Along the way, we stopped at several beaches and noted that the waves were much too strong to snorkel in safely. However, while we were hiking to Kahuku Point, the guys noticed that there was a perfect calm spot, so after some other obligations *coughPokemoncough* we returned and spent a few hours here. It turned out to be another great spot, with several fish spotted. Mitch also noted that it would be a great place to spot sea turtles in the summer when the water was warmer. However, the real highlight here was seeing a dog on a surfboard! This month, we had the pleasure of hosting some of our best friends from Arizona, Mitchell and Alex! It had been far too long since we had seen them, and this time catching up with them was exactly what we needed. Throughout our time exploring the island with them, we were reminded of simpler times, of who we were and the life we used to live before the military took control of our lives. We were also reintroduced to ideas and habits that we’d fallen out of, including the giving and receiving of allegations, all the controversies of life, and drinking tea. Throughout their time here, we managed to show off most of the island and do a wide variety of activities, which I’ll break down into 3 posts: the hiking, snorkeling/swimming, and sightseeing. Since hiking is the area in which we have the most expertise, I’ll start with that one. On their first morning here, Curtis was standing duty so the guys and I got up early to go for a sunrise hike. Since we had plans to snorkel afterward, we drove to Hanauma Bay and hiked up the paved path overlooking the bay. There wasn’t much of a sunrise this morning as it was overcast with periodic showers, but we managed to stay mostly dry and still could make out Molokai in the distance. Despite being so overcast, the ocean’s color was still bright blue and we had an excellent view of the coral that we would be snorkeling around — more on that later! Other highlights of this hike are the stray cats that are all over at the beginning of the trail, and the interesting cactus plants that somehow made us think of evergreen trees. Curtis was able to take days 2 and 3 (Thursday and Friday) off of work, so on Thursday we drove to the Leeward side of the island and started the morning by hiking to Kaena Point. We came hoping to see albatross, seals, and hopefully whales, and thankfully all three appeared for us today. We actually spotted the whale spouts on the drive up the coast to the end of the highway, and saw the seal on the rocks on the side of the trail rather than at the end where we usually see them, but these still qualified as sightings. There were less albatross at the end than there were when Curtis and I visited a few weeks prior, and most seemed to be moving/flying around rather than nesting. We ended our time at the point by climbing the steep path up to the pillboxes for a better look around. On Friday morning, we were all ready for a longer hike, and Curtis and I were excited to introduce them to the Ko’olau ridge trails. 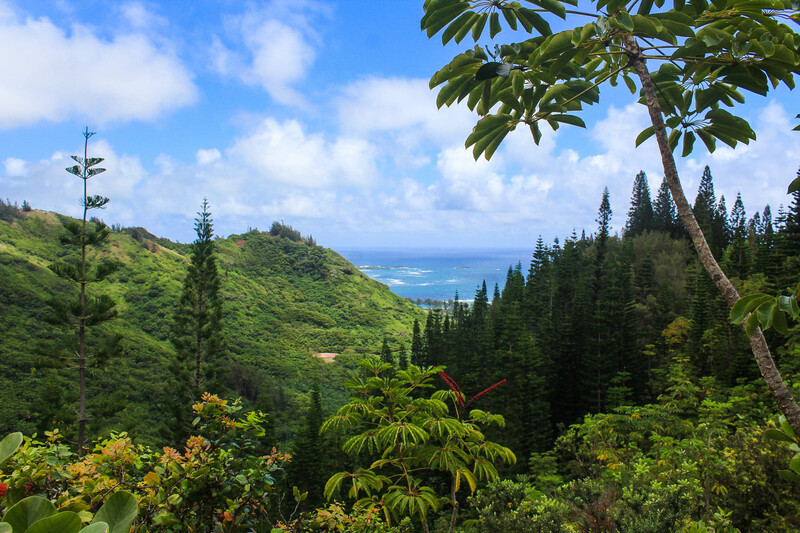 While pillboxes and easy hikes along the coasts are always beautiful, easy, and enjoyable, hiking in the Ko’olaus is something that every experienced hiker should do while visiting Oahu. Since there appeared to be clouds coming in, we decided to go for an easier trail so we wouldn’t risk being caught on a more exposed ridge in case the weather turned. Curtis and I have hiked Kuli’ou’ou Ridge a few times, but hadn’t in a while since it’s usually very popular. However, we found it almost completely empty on this Friday morning, and were in awe of how we were able to enjoy it so much more without the crowds. Not only that, but I was finally able to see the entire view without being obscured by clouds! One thing I have been wondering since moving here and hiking is how the trails here compare to Arizona, since it’s been a number of years since we’ve hiked there. The guys confirmed that these trails are considerably steeper, and we were quick to let them know that this was considered ‘easy’ by our standards now! Another fun thing was really being able to introduce them to somewhere new, since when we lived in AZ they were usually the ones with more experience! On Sunday morning, we set out to hike to Makapu’u Point, but were turned away by all the crowds. Here we were able to introduce them to our weekly frustration of being surrounded by tourists, and show them how we cope: by visiting the Leonard’s food truck and indulging in malsadas. Our back-up hike, Koko Crater Botanical Garden, almost fell through as well when we first arrived and found the usually empty parking lot completely full with several large vans, but thankfully after getting our malsadas and returning it had cleared out so we were able to enjoy a peaceful walk around. On their last full day here, the guys and I did a big loop around the North Shore and went for our last hike to Kahuku Point starting from Turtle Bay. Initially the plan was to hit the Northern, Southern, Eastern, and Western-most hikes (Kaena, Kahuku, Makapu’u, and Diamond Head), but with the crowds on Makapu’u and all the other activities we ran out of time — meaning they’ll have to come back to hit the others. 😉 But at least they were able to do the quieter, more remote hikes along the Western and Northern coast, see wildlife and witness the big North Shore waves. We even saw some more albatross here today flying over us. We walked along the beach on our way to the point, then took the inland trails back to the parking lot afterwards, where the guys learned that it’s important to wear shoes while walking under the ironwood trees. Welcome to another monthly update post! Over the past few months, I’ve been wanting to change things up on here and write about more than just hiking adventures, and this is an easy way to add something a little more personal to our blog. The daily routine that we’ve established over the past year is about to be shaken up, and I’m realizing that there will come a point where we won’t have weekly adventures to share. Blogging has been one thing that has remained constant for me through all of our life changes and moves, and I don’t want to give it up just because I don’t have a new exciting adventure to share. I’m still figuring out what this will look like, but expect to see more variety on here thrown in along with our adventures around this island. Let’s start with the good: A huge blessing this month has actually been Curtis’ watch schedule — somehow, he managed to have all weekends off this month! The one Saturday he had to work, he ended up getting President’s Day off the Monday following so we still enjoyed having 2 days together. That pattern ends now in March, so I’m making note of this so I can look back and be thankful. We don’t know what’s coming for the rest of 2019, but at least he was on island for all of the first two months. In other Navy-related happenings, February honestly started out with us expecting and hoping for certain things, but it turned out much different than we had wanted. Maybe I’ll touch on that later on this year. I always thought that by this point in Curtis’ military career, things would be more structured and straight-forward, and I’d be able to plan ahead and know what to expect. The 2+ year training pipeline was filled with unexpected hold ups, time “off” in between, and wondering what was coming next and where we’d be moving, so I looked forward to this point: where Curtis would be stationed with a command for a longer period of time and we would have a set schedule and know what was coming. Now, that whole idea just makes me laugh. 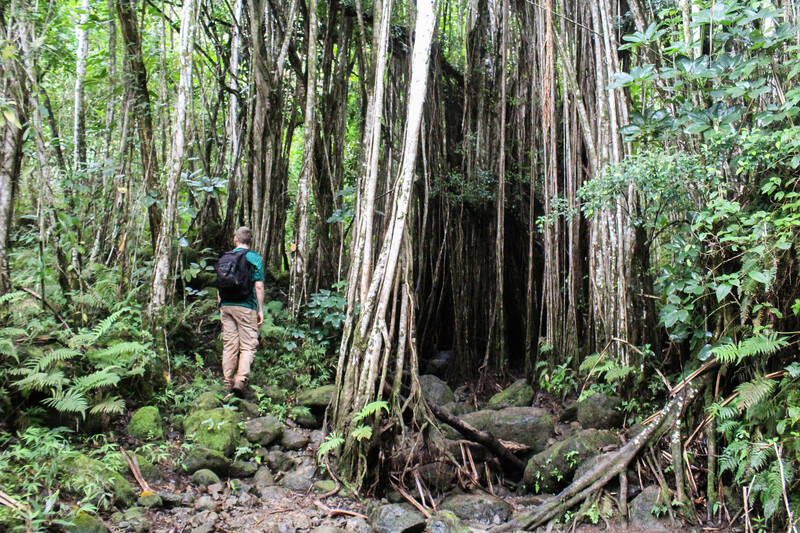 Our last hike on the Old Pali Highway…ever?? As it turns out, this phase of life is even LESS structured than before. It doesn’t matter if it’s long-term plans or the weekly duty schedule, it seems like everything is always up in the air. I don’t know where I came up with the idea that life would have more structure now, I think I was just so focused on the fact that we would finally live in one place for three years. Now all I can do is take things day by day, and find ways to be productive and creative on my own. When I sat down to write this update, I have to say that it bothered me that the only things that came to mind were all Navy related. I spend every day working and creating and doing a wide variety of activities, and yet at the end of the day whatever is happening with Curtis’ boat is how I remember that day. It bothers me that our life is controlled so much by Curtis’ job. If he had a civilian job, would it take over my life as much as the Navy does? I know a lot of what I’m sharing here is very vague, but unfortunately it’s not something I can talk about in depth. However, one thing that I’ve been thinking about is sharing more candid stories of things we’ve been through or done in the past that I can talk about freely now. I didn’t know much about military life before marrying into it, and while I wouldn’t change anything about our life and how we got here, there’s a lot I wish I would’ve known beforehand. So maybe I could write it as informative for new military wives…but honestly, I think it’s pretty entertaining and I’d like to look back and laugh at all those things that once gave me so much stress. Enough with all that, here’s a look at what we did in February 2019! • Spent Super Bowl Sunday hiking a couple of trails and at the beach — it’s always fun to take advantage of this day and visit places that are typically busier on your average Sunday. • Hiked the Old Pali Highway Trail on the 10th. One week later, there were massive landslides in this area, on the current Pali Highway and near the Pali Lookout. The highway is closed for what could be months and traffic has been worse than usual. Sadly we probably won’t be able to enjoy this hike again anytime soon! 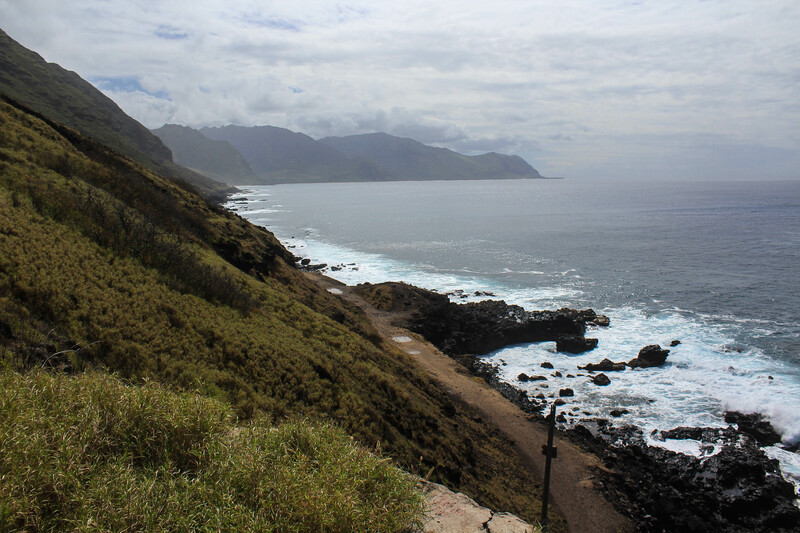 • Hiked to Kaena Point to see albatross and Makapu’u Point to see whales, and had success with both hikes! We hiked to Makapu’u on a sunny Sunday in the late afternoon and saw at least a dozen different whales between Oahu and Molokai. We also had a perfectly clear view of Molokai, Lanai, and Maui. • Visited Ho’omaluhia Botanical Gardens again, and walked around Kailua Town and our favorite walking trail many times. I have a goal of hiking/jogging/walking 1000 miles this year, and thanks to daily walks with (and without) Charlotte, I managed 108 miles this month, for a total of 262 so far this year. Not bad! We’re also excited to finally welcome more visitors coming in March — friends, spring might be just a couple weeks away, but that doesn’t guarantee warm weather or no snow. I highly encourage you to plan your visit soon. 😉 Also, if you have any suggestions or requests for future blog posts or topics, let me know because I’m open to new ideas! I hope you all have a wonderful March! I remember very clearly the day I learned that Hawaii had year-round perfect weather. Never too hot, never too cold, and no snow. My thoughts were probably something along the lines of, “I want to move there.” Long story short, I did. I’ve only lived here a year and a half so I’m no expert, but as the months have passed by, I’ve begun to notice little changes in the weather and the scenery. 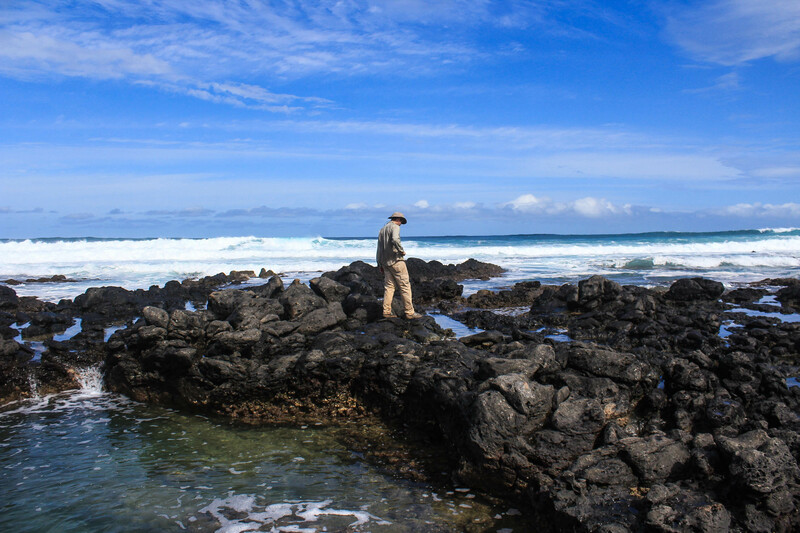 In this post, I’m gathering what I’ve learned about seasons in Hawaii. It’s a HUGE relief to not ever have to think about heating our home, shoveling, or driving in the snow. Getting dressed in the morning takes no thought whatsoever. I rarely look at the forecast, unless I’m planning to hike or drive to a different part of the island. Before arriving on island, I used to track the temperatures and it seemed like they hardly varied; they were always between highs in the 70s-80s, lows in the 60s-70s. However, now that I’ve adjusted to the temperatures, it feels like there’s a much bigger difference between those numbers. In the ‘winter,’ I really do wear my sweaters. No air conditioning? No problem! Our windows are open 24/7 and we happily welcome the trade winds that pass through. After it rains a lot, people start to say, “Things are going to be so green!” And I think to myself…what color are they now? I’ve only recently begun to notice the very subtle differences in vibrancy of the greens on the island. The hardest season here is fall: When everyone starts going back to school and the words ‘pumpkin spice’ begin appearing everywhere, all I want is to feel crisp air on my face and pull out my earth-tone sweaters and drink hot chocolate. However, summer just has to stick around a few months longer, to the point where all those special fall things have worn off. Once it finally begins to cool down, you have to make a choice: long sleeves or hot chocolate? Doing both will make you too hot! Thanks to years in the military, I’ve learned to thrive on change, and the lack of change in seasons messes with my mind. I like having things to look forward to, even as simple as weather changes. At first, it seemed as though the only thing changing was the pages on my calendar; however, now that I’ve lived here a while, I’m starting to take note of the little things that change. So what really changes? Here is my list — I’ll add onto it as I continue to notice more. In a way, I think of each item as its own season, as something to look forward to. Summer [May-October] | Summer begins a little earlier and ends a little later here than it would on the mainland. The temperatures are in the 80’s-90’s depending on what side of the island you’re on. The forecast is drier than it is in the winter, but it will still rain occasionally. Rainy [November-April] | The rainy season brings cooler weather, more trade winds, and of course more rain to the island. It isn’t raining constantly, but there are some weeks when it feels like it’s constantly grey and wet. I hear locals joke about how tourists are the only ones in the water. 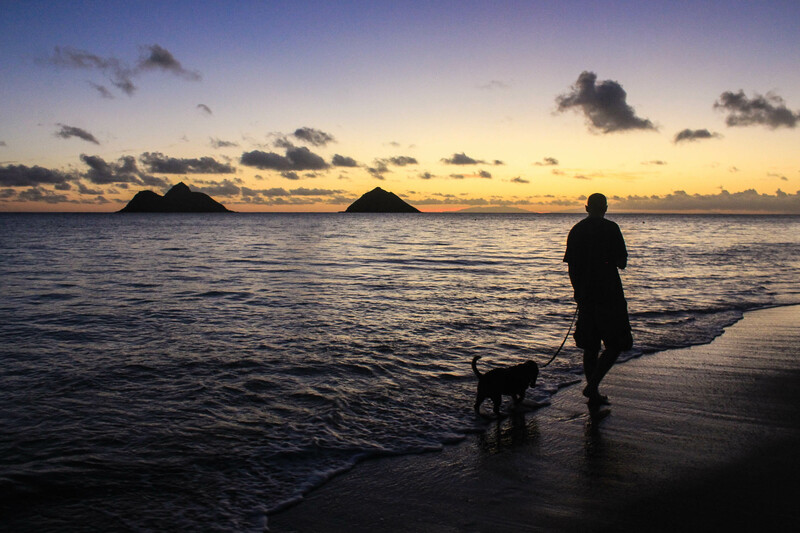 If you’re traveling during this time and concerned about a rainy forecast, know that the rain typically hangs around the mountains and the Windward (East) side of the island, so check out things to do on the West side. Hurricane [June-November] | Hurricane season isn’t usually eventful here as it can be on the East Coast of the Mainland, but there are occasional hurricanes and tropical storms that pass by. It seemed as though there were a lot of storms last year, but none had as much impact on the islands as was predicted. Hurricane Iniki was the last one to actually make landfall, and that was on Kauai in September of 1992. North Shore Waves [November-February] | If you’re into surfing, visiting the North Shore in the winter is the place to be. (We honestly don’t know anything about surfing, so if you’re like us and don’t plan on it, we advise you avoid the North Shore on days when the waves are bigger because traffic can be pretty backed up!) 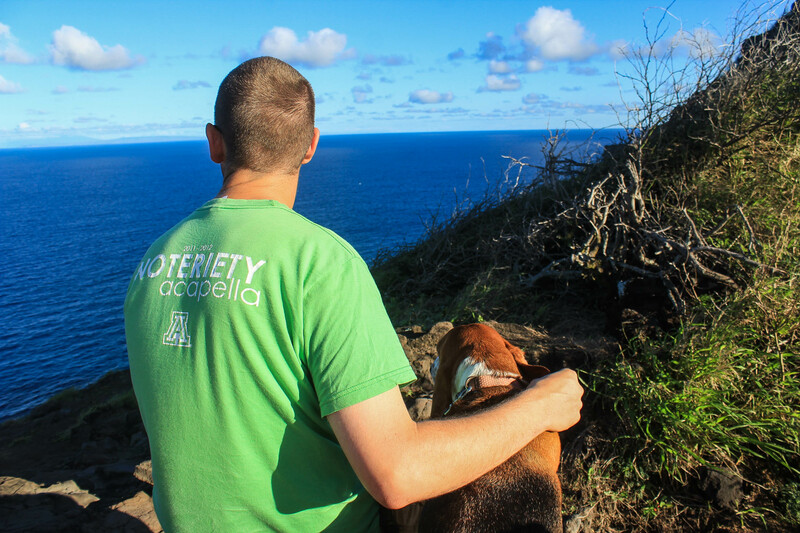 Obviously there are beaches everywhere if you want to get up close to the waves, but if you’re interested in hikes that give great views from above, check out Ehukai Pillbox and the first couple miles of Kealia Trail. 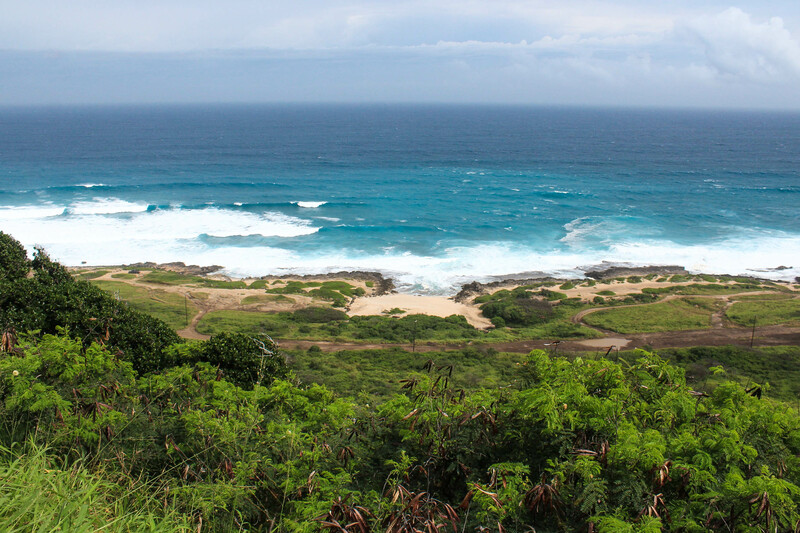 For easy hikes that walk along the coast next to the waves, try Kaena Point and Kahuku Point. Albatross [January-March] | If you’re visiting during these months, you MUST hike to Kaena Point to see the great albatross birds! We’ve visited in February 2 years in a row and seen so many birds nesting in this wildlife sanctuary. Watch the birds soar overhead with their giant wingspans, the male birds do their special ‘mating walk,’ and if you’re lucky you might spot a grey fluffy little baby albatross — ok, maybe they’re not that little! Whale [November-March] | Late every fall, the humpback whales make their way down to the islands from Alaska. 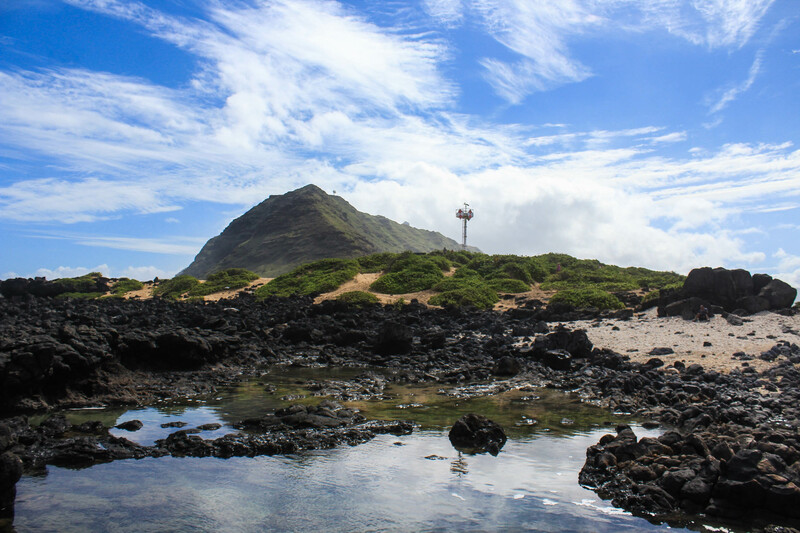 If you’re visiting during these months, there are several easy hikes you can do where you may be able to spot them, such as the Makapu’u Lighthouse hike. Our sightings have all happened on the South Shore or at Kaena Point. There are also whale cruises you could take that would get you up close and personal! Jellyfish [July-October] | If you plan on getting in the ocean, watch out during these months because they are known to be jellyfish and Portuguese man-of-war breeding season, meaning they are found closer to the shore. We honestly don’t get in the water that much anyway, but it’s also important to watch your step while walking on the beach so you don’t step on one! 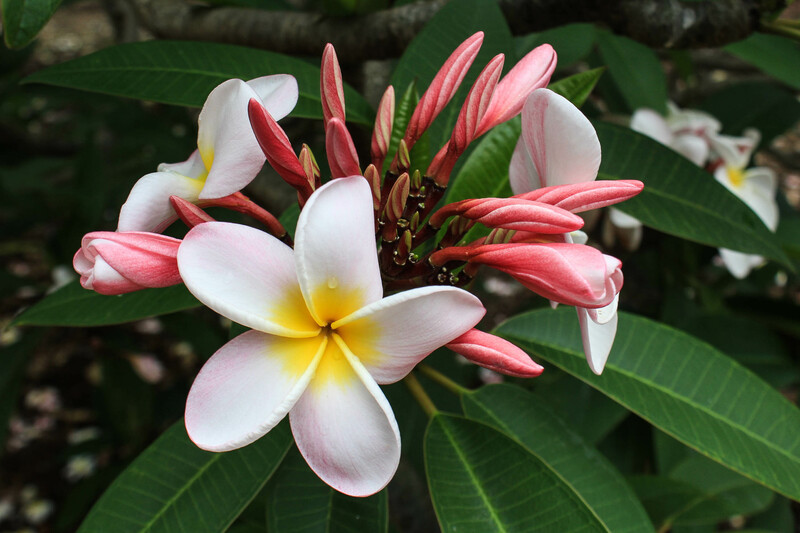 Plumeria [May-October] | The beautiful flower used to make leis comes from a tree that blooms in the dry/summer season. During the rainy season, the trees are mostly bare. If you’re visiting during the summer, Koko Crater Botanical Garden has a large plumeria grove with flowers of all colors and is definitely worth a visit! Mango [Flower January-March; Fruit May-July] | This one likely has the largest impact on us because we have a giant mango tree in our yard. I thought that it only produced fruit every other year, but now in February it’s flowering again for our second mango season, and I’m so excited! If all goes well, the fruits will be ready probably in June or July. Right at the end of its season, it drops its leaves while simultaneously growing new ones, so the tree is never bare. And we get to enjoy weeks of daily raking. I guess you could say fall comes early for us! Lychee [June-July] | I had no idea what lychee was before moving to the islands…but now that I’ve tried it, I don’t know how I’ll be able to live in any other place that doesn’t have it. 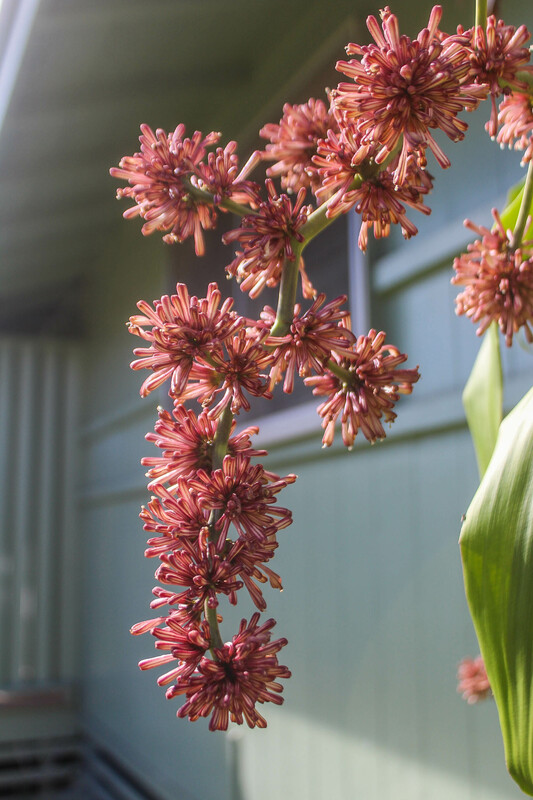 It has a limited season and depending on the harvest, they can be a little pricey, but if you’re here in these months you should give it a try. Unfortunately we have yet to see it along a trail, so we haven’t been able to forage for it yet. However, if you aren’t here while they’re in season or can’t find it for sale, there are plenty of foods that come in lychee flavor as well, so keep your eyes out for it! Guava [August-October] | Something that’s pretty unique to Hawaii hiking is the fact that you can sometimes forage for unique fruits while on the trail. 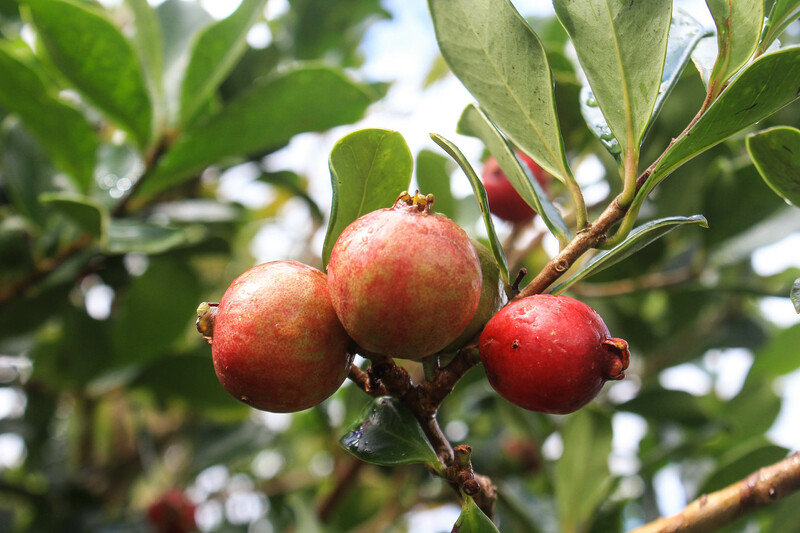 If you’re hiking between these months and notice small red fruits on the ground and tall bushes surrounding you, chances are it’s probably guava. (Make sure you familiarize yourself with what it looks like before putting strange berries in your mouth.) 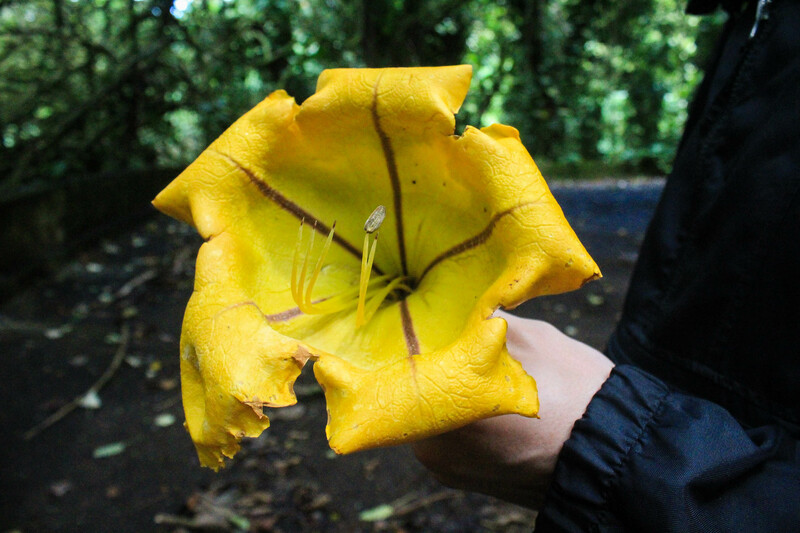 We’ve enjoyed foraging on Pu’u Pia, Aiea Loop Trail, and Pu’u Ma’eli’eli, though it can be found on many other trails. It’s actually an invasive species from Brazil and is sadly taking over the native plants of the island. Consider any fruit you consume a way of preventing its seeds to be sown in the future. Sunrises | Obviously the sunrises year-round are incredible, however I think my favorite time of year to see the sunrise is in the winter. One reason being the obvious advantage of happening later so we don’t have to wake up as early, but also because when the sun rises to the Southeast, you can see Molokai, Maui, and Lanai islands clearly on the horizon. If you’re planning a trip to Hawaii and are open to visiting any month, I hope this list can help you narrow down and decide when you’d be most interested in visiting. If your trip is already planned, I hope you can take advantage of what’s in season and that our suggestions will be helpful! If you live in Hawaii, what’s your favorite season? As people who hike often, there are many things we have concerns about while out on the trails. I worry about wildlife encounters often — well, I did when we lived in Arizona, but not as much in Hawaii I suppose. We worry about being caught in a freak storm or hiking after dark. We worry about getting lost on less obvious trails. Obviously the biggest concern is always safety, and we do everything we can from our hiking preparations to execution to make sure we arrive back at our car in one piece. But do you know what my second biggest worry is while hiking? It’s losing something important somewhere along the trail and not realizing it until we finish the hike. For me, it’s a toss up between camera, phone, and car keys. I always, always, always carry my camera cross-body, the only time it’s not on me is when Curtis (or another hiker) is taking a picture for me. I’ve forgotten my phone a couple times, but both times I’ve realized it was missing before reaching the car and remembered the last exact place I set it down. Car keys, however, seem like the most immediately inconvenient thing that can be lost along the trail. Especially the ones nowadays that have the special chip in them and are the only ones that can start the car. I guess I always knew the day would come, when we would either leave them locked inside the car before a hike or lose them along the trail…but after 5 ½ years, it finally happened. Let me share the backstory: At the last minute, Curtis was given President’s Day off of work, so we wanted to go for a hike. We remembered how much we enjoyed doing Kaena Point over last year’s President’s Day and decided to return once again. 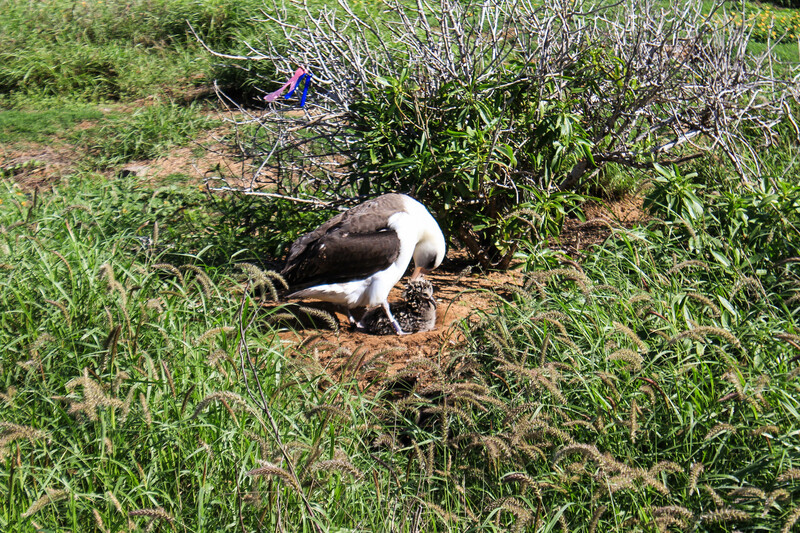 This is the perfect time of year to go and see albatross nesting in the wildlife sanctuary, and it’s an easier and safer hike to do after heavy rain. We packed up the necessary things: water, snacks, rain jackets, camera, phones, and charger cables. While sitting in the car still in front of the house, I remembered that I didn’t have my portable charging bank for my phone, something that comes in handy since my phone is 5 years old and has a 3 hour battery life. I asked Curtis if I should run in and grab it, and he said no, we’d be fine. And so we drove to Kaena Point on the North Shore, about an hour away from home. Once at our destination, we collected our things and made our way to the trailhead. Curtis then realized he wanted his hat, so he went back to the car to retrieve it out of the trunk. I remember hearing him press the lock button and the car honking in response. We set off on the trail, doing our best to avoid giant mud puddles and enjoying the easy walk in the sunshine. We made it to the point (about 2.5 miles away) within an hour, and took plenty of time to admire the wildlife. 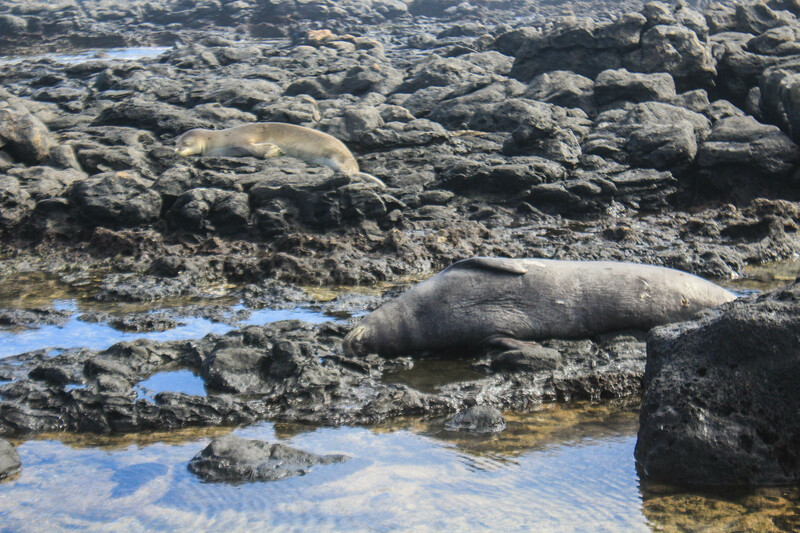 We spotted 2 monk seals napping on the coral, and wandered around the tide pools looking for sea creatures. Curtis spotted an eel and took a video of it. The most exciting part today though was the albatross. We spotted a mother with her giant baby in the exact spot we saw one last year, marveled at the enormous wingspan as they flew over us, and laughed at the way the males interacted with each other. After spending a considerable amount of time here, we left the gated wildlife sanctuary and wandered over to a lookout over the West side. Finally, we were ready to return to the car. Again, we made quick time hiking back to the car, this time the trail considerably busier with lots of hikers and families hiking to the point. We maneuvered our way around the last big mud puddle, and strolled back to our car. That’s when Curtis realized…he didn’t have the keys. First we checked and double checked inside every pocket of his cargo pants, and thoroughly dug through the backpack even though we knew he didn’t put them inside. We looked all around the large parking area and around the car, and I checked garbage cans just in case. Curtis thought they could be in the trunk, but I told him I remembered hearing the car honk when he locked it. However, he had done that before going back to retrieve his hat, so maybe my mind was confusing the order of events. Our phones were both at low battery, under 20%. Curtis handed me his phone with the phone number for his insurance and policy number, and then he set off to rehike the entire trail and look diligently for the keys. I called our insurance and requested a locksmith so that we could confirm whether or not they were in the trunk. I was pleasantly surprised at how fast the locksmith arrived, given we were at one of the more remote spots on the island. He unlocked the car but left before I even opened the trunk. Opening the trunk confirmed that there were no keys inside, and also made the car panic for a minute and there was nothing I could do to stop it. At least I now had a spot to sit and wait for Curtis. Unfortunately I still had his phone, so all I could do was pray that he would look hard and not assume they were in the car. After about 2 hours of retracing his steps, Curtis returned empty handed. He didn’t remember ever hearing the keys fall, and suspected that the time it was most likely to have happened was when he was taking his phone out of his pocket at the point and around the tide pools. If they had fallen in the tide pools, they were likely long gone. There wasn’t much we could do at this point — like I mentioned at the beginning, this is the kind of key that has the chip in it, so any regular spare key wouldn’t be able to start the car. I suppose we could’ve either gone back and kept looking, or maybe called a cab and returned another day, but it was getting later and we realized our only option was to have someone come and make us a new key. Thankfully that is actually a thing — within an hour and a half, someone arrived and made us a brand new key on the spot! However, it came with a big price tag — a costly mistake to make. But now that this has happened to us, doesn’t that make the odds of it happening again much lower? 😉 I have to also give a shout-out to our old phones for miraculously not dying on us and actually finding signal while we were frantically searching for phone numbers online with very limited service. It’s like they know we’re fed up with their usual shenanigans and ready to replace them. This is the story of two trails: One legal, one illegal. We set out on a weekend morning with all the best intentions: the illegal trail was more enticing, but we were going to stick to our moral high ground and hike the legal trail. It wasn’t going to be scenic, but at least we could feel good about ourselves… and that’s what matters, right? 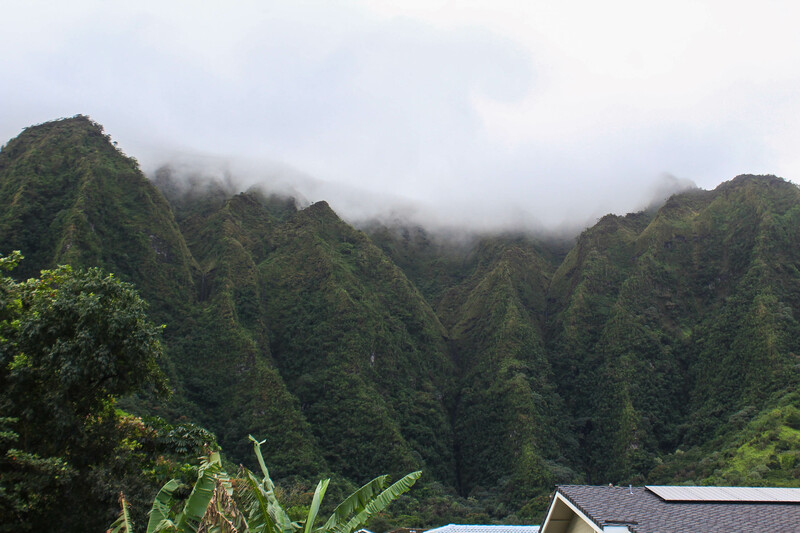 We drove to Kaneohe, a little ways North of the Valley of the Temples, and back into a residential area to the trailhead for Ahuimanu Trail. Google Maps directed us to the back of the neighborhood and we spotted a small gap in the trees with a shrine next to it. We parked on the side of the road and made our way to the trail. 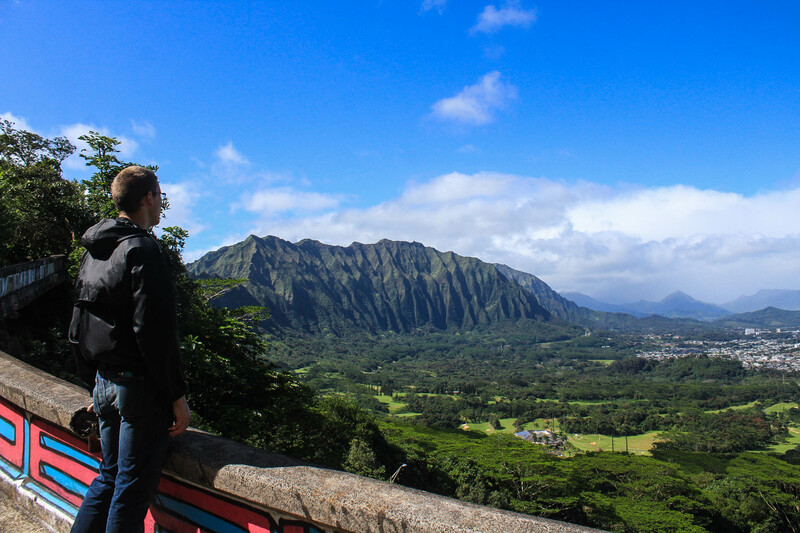 When we had a better look at the shrine, we realized it was for a well known hiking enthusiast from Oahu who died tragically on this trail last year – Freddie Pratricio, aka Spiderman. The trail itself isn’t dangerous at all, he was repelling the waterfall at the end. Right from the start, the trail was muddy. There were mosquitos everywhere. We expected that, it had rained a lot that week. However, the trail itself wasn’t the easiest to follow, and there were so many fallen trees lying across the path. We often had to stop and make sure we were on the right path. We baptized our feet into so many mud puddles that were just a little deeper than they appeared. Finally, we stopped to face the facts: This wasn’t a good day to hike this trail, and we simply weren’t enjoying any part of it. Why should we continue? Maybe someday we’ll return…but honestly I’d rather re-hike any number of trails we’ve done before than come back to this. Curtis said he thought it could have more potential if we just followed the creek back, but that didn’t appeal to me today. Back at the car, we decided to “drive by” the illegal hike and get an idea of what it looked like…how illegal it really was. As the crow flies, it’s only 3 miles North of the first trail, but begins at the end of a completely different neighborhood, a 20 minute drive away. 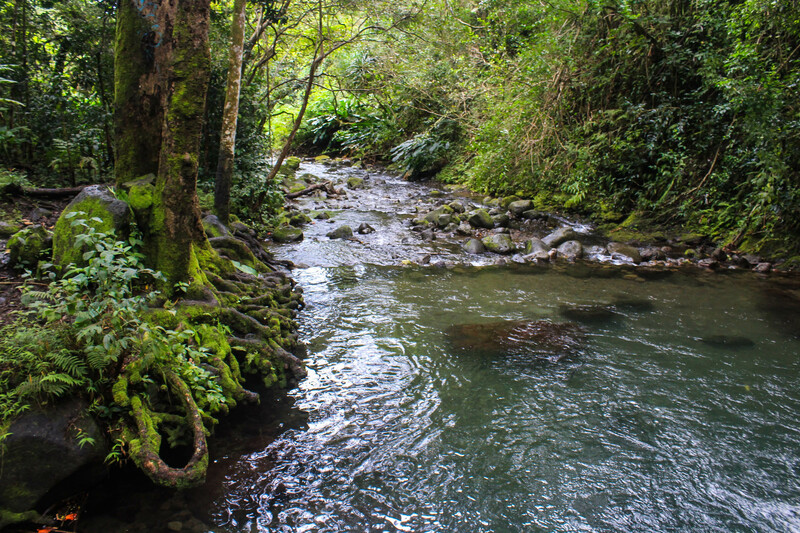 We drove to the end of the cul-de-sac where the trail to Hamama Falls begins. Even from a quarter-mile away, there were cars lined up on the side of the road all the way up to the trailhead — as opposed to us being the only ones on the legal trail. We reached the end of the street, and there was a giant fence blocking the trail, which is actually a service road that leads to a water plant facility. There were plenty of “Government Property, No Trespassing” signs, and yet a well-worn trail that went off to the side of the fence where it was clear that many had used to get around the obstacle. We didn’t want to do it, we didn’t want to break the law and we definitely didn’t want to be caught and fined. However, curiosity got the best of us, and we gave into temptation. We have now joined the multitudes of hikers on Oahu who have hiked a blatantly illegal trail. We have set a bad example and you should never take our advice or follow our lead. Worst of all…we enjoyed it. First, this just made such a good trail for the day. We walked along the paved road, and our feet stayed dry and out of the mud. 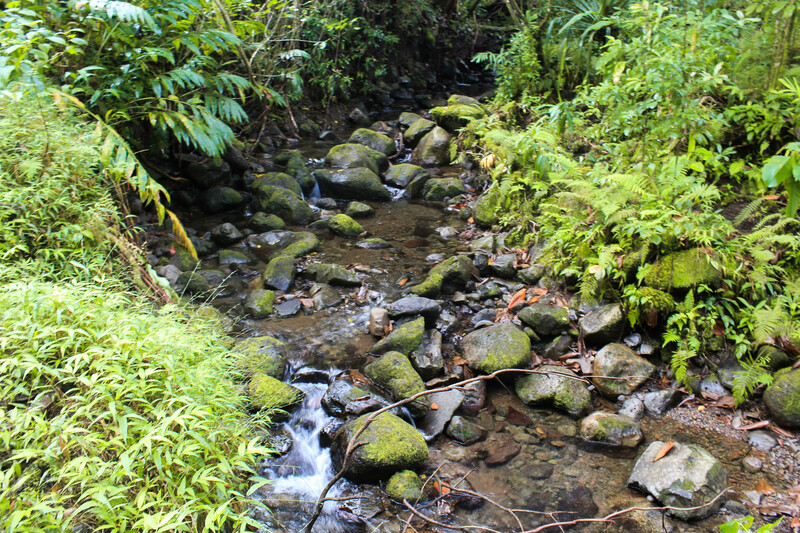 We had views of the Ko’olau Mountains, beautiful flora, and a babbling brook. We saw plenty of people, but most were heading in the opposite direction. We picked up trash along the way just to clear our conscious. After about a mile, the service road ends and the last mile to the falls is along a dirt path. Here’s the real kicker: this dirt path to the falls was one of the best maintained trails we’ve hiked on this island. Sure it was a little muddy and slick in places, but any trail would be after all the rain we’ve had. 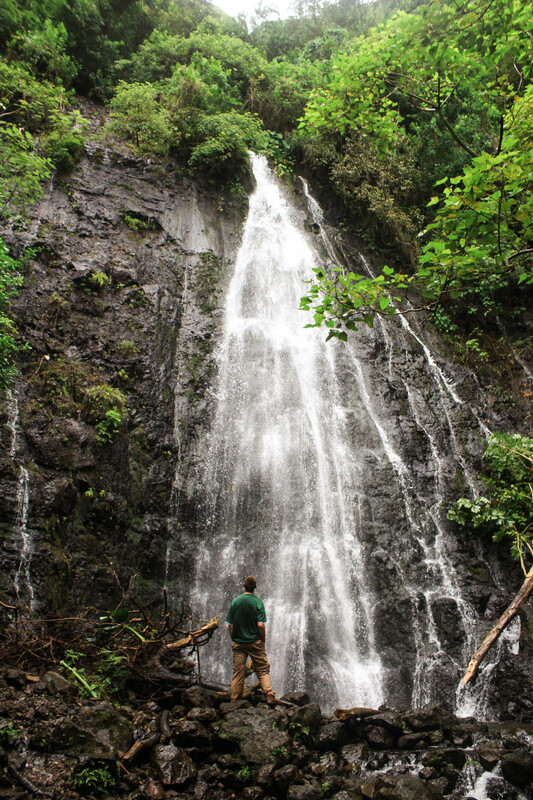 We strolled up the path, which became steeper, but led to a great reward: Hamama Falls, one of the best waterfalls we’ve seen on the island (Maka’ua Fall remains Curtis’ favorite). Official Trails: Well maintained and established trails usually designed for large numbers of tourists, almost to the point that some might not even consider them trails. Makapu’u and Diamond head are probably the most notable on the island. Sanctioned Hikes: Hikes that are legal and have some active maintenance authority. Most of the trails that we’ve hiked on the mainland would fall under this category, but here on Oahu, probably only half the trails do; and oftentimes only parts of the trails are. Notable examples are Kaena Point, the Aiea Loop, and Kuli’ou’ou. Illegal Hikes: Don’t do these hikes. They are illegal…for a reason. Maybe people die on these trails, maybe it’s trespassing. Regardless, the rules are enforced here, often with severe consequences. Sacred Falls and Staircase to Heaven are easily the most recognizable of this category. All went well until we arrived back at the beginning of the trail and saw 2 police cars. This is it, I thought…I wanted to hide, but Curtis encouraged me to come out so we could own up to our felony together. However, we walked right past the cars and nothing happened. Somehow, we walked away free. Definitely don’t take that as encouragement to go do this hike…hike at your own discretion, I’m not bailing you out if you get caught. In all seriousness, I have no idea if people get fined or exactly how illegal this trail actually is. My suspicion is that the neighborhood/board of water supply don’t want this to become the next Manoa, Lulumahu, or Maunawili Falls, which have crowds of people every day. Of course, we saw that the trail already gets plenty of traffic as it is, but maybe they are trying to avoid becoming a stop on a tour bus route. Whatever the reason, it’s still an illegal trail, and while we enjoyed our hike we won’t be returning. We’ve pushed our luck already as it is! Still, the question remains: Why can’t legal hikes on the island be as well maintained as this illegal one?